If you’re feeling frustrated with your financial company, you’re not alone. Many consumers have bank complaints or credit card complaints. The Consumer Financial Protection Bureau (CFPB) was set up to help consumers lodge complaints about financial companies. The CFPB also publishes anonymized data of all the complaints it receives. Looking to earn rewards for your spending. Our rewards card guide can help. 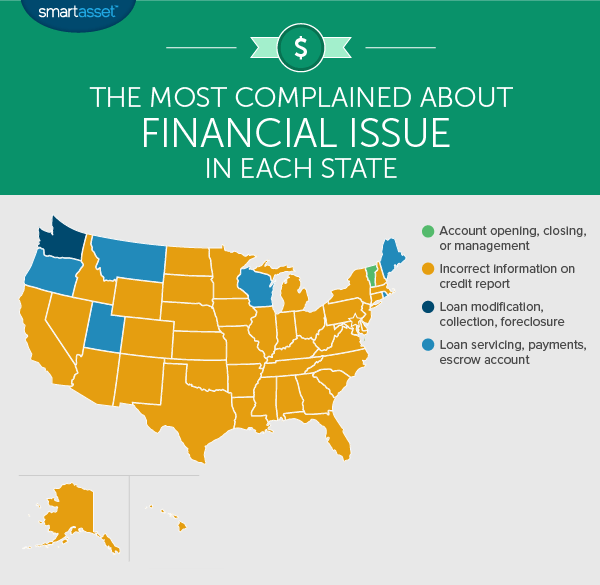 SmartAsset dove into CFPB data to find the most common financial complaints by state. The CFPB categorizes the complaints it receives by product, which includes bigger topics like mortgage or credit cards and then specific issues within each topic. For example, if a consumer wanted to complain about incorrect information on their credit report, they would file the complaint under the larger category of credit reporting and then the more specific issue of incorrect information on credit report. In this article we look at the larger products each state complained about the most and the specific issues they complained about the most. Some states complain more than others – There is a stark contrast between states and their complaint rates. Alabama, for example, complained at a rate of 4.34 per 10,000 residents. In contrast, Delaware complained over twice as often, with 9.46 complaints per 10,000 residents. Complaints tend to vary by region – Mortgage complaints are high in all nine states in the Northeast. 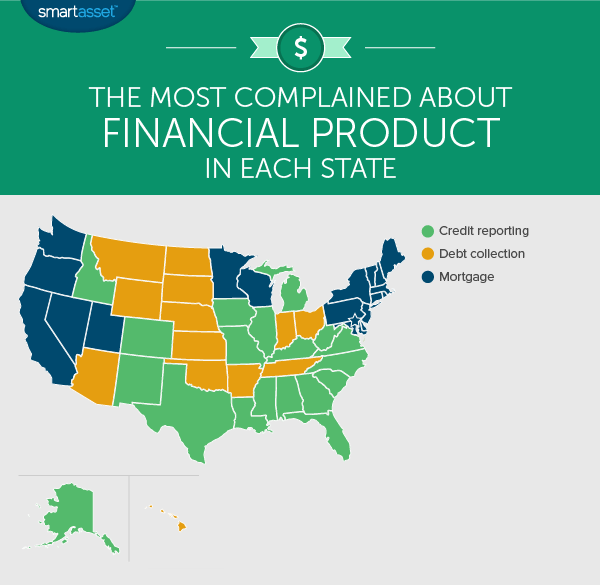 The majority of complaints in Connecticut, Maine, Massachusetts, New York, New Jersey, New Hampshire, Pennsylvania and Vermont are about mortgages. Several states in the Midwest, including Indiana, Kansas, Nebraska, North Dakota, South Dakota and Ohio had the majority of complaints falling under debt collection. And many Southern states, like Alabama, Florida, Georgia, Kentucky, Louisiana, North Carolina, South Carolina, Texas and Virginia, lodged the majority of their complaints in the credit reporting department. Incorrect credit report issues dominate – At the financial issue level, people are most likely to complain about incorrect information on their credit reports. In 43 states, the majority of financial issue complaints were about incorrect information on credit reports. In fact, nearly 17% of all CFPB complaints are about trying to correct a credit report. No other issue accounts for more than 8.9% of the total. Credit report complaints were the most frequent gripe in 19 states, including the majority of the South. Florida, Alabama, Arkansas, Texas, Louisiana, Georgia and Mississippi are some of the states where this product was the top complaint. The vast majority of these complaints (just under 74%) are about incorrect information on credit reports. Having incorrect information on your credit report can hurt your credit score, making it harder to get approved for a mortgage or a credit card. That’s why so many people go through the trouble of filing complaints about inaccurate information. It’s important to remember that you are allowed one free credit report per year from each of the credit bureaus. Make sure you are being diligent about checking your credit report and catching potential inaccuracies so you can get them corrected. The other four issues which fall under credit reporting complaints are credit monitoring or identity protection; credit reporting company’s investigation; improper use of my credit report; and unable to get credit report/credit score. However those four issues combined only make up 26% of all credit reporting complaints. If you have had debt go into collection, you likely know how frustrating getting hounded by debt collectors can be. Debt collection complaints made up 21% of all CFPB complaints. It was the leading product that consumers complained about in 13 states. The states which complained the most about debt collection are mostly in the Midwest. This includes states like Indiana, Kansas, Nebraska and North Dakota. Complaints about debt collection was also the top complaint in Hawaii. Interestingly the main frustration around debt collection was not the communication tactics used (this accounted for 13% of complaints under this topic) but rather continued attempts to collect debt not owed (41% of complaints). Many consumers filed reports saying they had already paid the debt they owed or they never owed debt in the first place. The final 19 states filed the majority of their complaints about mortgages. All nine states in the Northeast complained the most about mortgages, so did several others sprinkled around the country, including California, Washington, Utah, Minnesota and Wisconsin. When consumers complain about their mortgages, they typically complain about mortgage payments. Some people made complaints about the act of making payments (41% of mortgage complaints), while others said they were unable to afford payments and their financial institutions were unhelpful in finding a solution (39% of mortgage complaints). One option for people struggling to make mortgage payments is to refinance on better terms. A large number of consumers reported issues pertaining to incorrect information on their credit reports. Due to the ubiquity of credit reports, it may be unsurprising to see that in a whopping 43 states, incorrect information on credit reports was the number one issue. Unfortunately, correcting mistakes on a credit report can be time-consuming. One tip for people disputing claims is to do it by snail mail rather than online. Some online dispute forms may contain clauses which will take away your ability to sue the credit bureau if it does something wrong. Keep in mind that credit bureaus have no obligation to investigate claims they consider to be frivolous. So if you are going to file a complaint, make sure you’re reading your credit report correctly. Under this category, consumers complained that they attempted to make mortgage payments and those payments were not accurately reflected on their accounts. This may mean that payments were lost or electronic payments were not being credited to consumers’ accounts. Other consumers reported similar issues in which payments made to their escrow accounts were not applied accurately. Only one state, Vermont, had the majority of disputes falling under the issue of bank account management. The CFPB classifies this as “account opening, closing or management.” Consumers who fall under this category typically complain that they are unable to close an existing bank account or they are experiencing trouble opening a new one. For those with bank account complaints, switching banks may be an option worth considering, especially if you can find one with a more favorable savings account interest rate. The state of Washington made the majority of its complaints about problems arising when homeowners are unable to pay their mortgage. The CFPB’s official name for this category is “loan modification, collection, foreclosure”. This means people who complain under this category are struggling to afford payments and are looking for solutions. Typically complaints in this category are about a lack of responsiveness from the consumers’ mortgage originator. An example of this would be a consumer who complained about being unable to contact the mortgage originator when they are in the middle of a loss mitigation review process. Another example is consumers who complained payments are still unaffordable even after having their loans modified. Interestingly despite this high rate of complaints, only 1.61% of mortgage debt in Washington is delinquent. Overall there were about seven complaints under this issue per 100,000 residents in Washington. If you are struggling to make mortgage payments, loan modification is one way to find relief or you could consider a short sale. In order to find what each state complained about the most, SmartAsset looked through all CFPB data from 2016. We looked at data at the high product level (for example, mortgage or debt collection) and at the more specific issue level (for example, incorrect information on credit report). Then we looked at the total number of complaints per state and determined which product and which issue received the highest number of complaints. Note that in a single state, the issue that’s complained about the most may not fall under the product that is complained about the most.